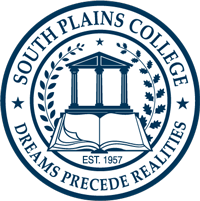 South Plains College provides the opportunity for students to apply credit by examination from international and nationally recognized programs. The examinations recognized by South Plains College include College-Level Examination Program (CLEP), The Advanced Placement Examination (AP), The International Baccalaureate Programme (IB), and the Defense Activity for Non-Traditional Education Support (Dantes). Credit gained through any testing, such as CLEP, AP, SAT and ACT, for which SPC awards credit must be claimed within five years of the administration date of the test. Students must submit original test scores to South Plains College. This credit is not granted until the student is enrolled and has completed nine (9) semester credit hours at SPC. A student is required to petition for any credit for which they may be eligible. This includes making available scores and/or transcripts from the aforementioned examination programs. No letter grade is assigned for credit earned by examination nor is the credit computed in the student’s grade point average. A student’s transcript will be denoted CR for all credit awarded through credit by examination. The credits stated here are in accordance with South Plains College policies and do not guarantee acceptance by transfer universities. When a student plans to transfer to another institution, it is the student’s responsibility to contact the university for policies on acceptance of credit by examination. Complete information concerning the credit by examination program, its policies and regulations and the costs of the exams may be obtained from the Advising and Testing Center on the Levelland Campus. South Plains College is an open National Testing Center for the College-Level Examination Program (CLEP). Tests offered by the CLEP program are scheduled on a monthly basis on the Levelland Campus. Pre-registration is required in order for a student to sit for the test. Students may send their scores to other colleges. South Plains College will award credit by examination according to the table below. The credits stated here are in accordance with South Plains College policies and do not guarantee acceptance by transfer universities. When a student plans to transfer to another institution, it is the student’s responsibility to contact the university for policies on acceptance of credit by examination. Except as noted under the section “Credit by Institutional Examination,” credit will not be awarded to a student who has attempted the same course or its equivalent. A student must be currently enrolled at SPC to receive CLEP credit hours. Pre-registration is required in order to test. For information, contact the Advising and Testing Center on the Levelland Campus at (806) 716-2368 or 716-2530. The AP examination program is the final examination for a nationally standardized course offered in a limited number of secondary schools under the auspices of the Advanced Placement Program. The AP exam is offered once a year during May at participating high schools and scores are reported in July. For imformation, contact the Advising and Testing Center on the Levelland Campus at (806) 716-2368 or 716-2530. Credit from AP cannot be given to a student if the student has enrolled in the course previously. The IB program is an international program of courses and examinations offered at the high school level. South Plains College will award a minimum of 24 semester credits to students that have earned the International Baccalaureate diploma. Students that participated in the IB program but did not earn an IB diploma will be given consideration for credit on an indivdual basis. For information, contact the Advising and Testing Office on the Levelland Campus Advising and Testing Center on the Levelland Campus at (806) 716-2368 or 716-2530. South Plains College recognizes credit by examination from the Defense Activity for Non-Traditional Education Support (DANTES) program. Students may present DANTES scores to the Office of Admissions and Records, where the evaluation procedure will be initiated. Appropriate instructional departments and the Advising and Testing Center on the Levelland Campus will assist with the evaluation when needed. The Credit by Institutional Examination Program is established to provide a means whereby college credit may be granted to a student who is able to demonstrate sufficient knowledge or competencies which have been acquired through non-traditional educational experiences. To determine whether an institutional examination(s) is offered for a particular course, the student should contact the chairperson of the department or the coordinator of the program in which the course is taught. The method(s) of assessment of student competence in each course will be determined by the faculty in the department involved in teaching the course. All examinations are thorough and comprehensive and are equated with a specific South Plains College course number and description. The format of an examination is determined by the subject matter. A student may attempt a specific examination only one time. Credit is awarded only when the student is already officially enrolled at South Plains College at the time of the examination or when the student officially enrolls at South Plains College after taking the examination. Credit by examination may not be granted to a student for a course in which the student is or has been officially enrolled except upon the written request of the instructor and departmental chairperson. Upon successful completion of an examination, the Admissions and Records Office will post the appropriate course title, number and credit hours to the official permanent record. Credit earned through institutional examination is not calculated in determining grade point average. Eligibility requirements may vary by department, program or instructional area as necessary to validate specialized competencies. A fee is charged for each institutional examination attempted. For more information, please contact the Advising and Testing Center on the Levelland Campus at (806) 716-2368 or (806) 716-2530. Certain examinations for credit are equivalent in content. Credit will be advanced for successful completion of only one examination if the student submits test results for any two corresponding examinations. Credit by examination awarded to students to meet South Plains College graduation requirements is no guarantee that such credit will transfer to other institutions. Generally, the combined credit by examination from all sources shall not exceed 16 semester hours toward degree requirements. If rare and unique circumstances indicate that an exception to exceed the 16 semester hour limit on credit by examination should be considered, the exception shall be granted only upon recommendation by the departmental chairperson, where applicable, and with the approval of the appropriate Divisional Dean. Credit earned by examination is equivalent to credit earned by taking the course. Credit will be awarded only when the student is already officially enrolled at South Plains College at the time of the examination or when the student officially enrolls at South Plains College after taking the examination. After the student receives the examination score, he/she may choose to accept or decline the credit and placement for which he/she is eligible. The student should contact the Advising and Testing Center on the Levelland Campus to accept credit and have the results placed on his/her transcript. For a student who attended college prior to taking the examination, the amount of credit awarded will depend upon what college courses he/she had taken before the credit examination. Except as noted under the section, “Credit by Institutional Examination,” credit will not be awarded to a student who has attempted the same course or its equivalent. elects to receive credit in both semesters of history by exam must take another three-hour course in American History. All catalogs © 2019 South Plains College. Powered by the Acalog™ Academic Catalog Management System™ (ACMS™).